Do you have a local business? Want an effective way to market to people who are near you? 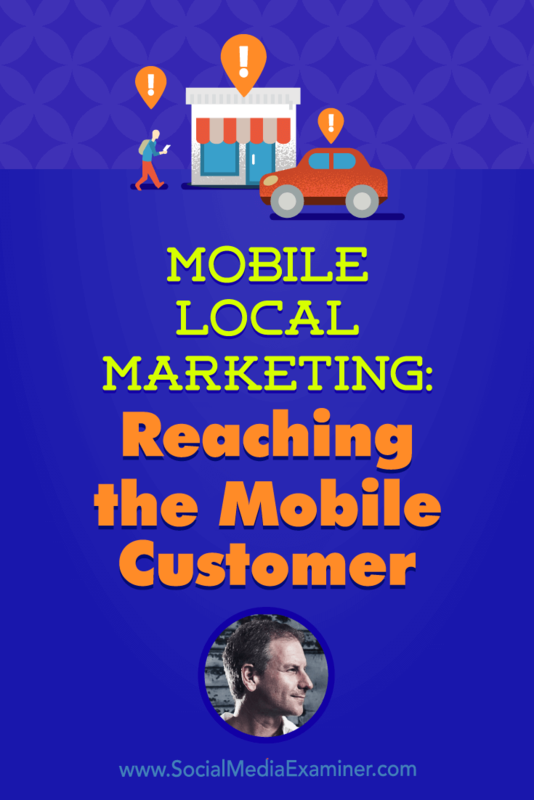 To explore how to reach your customers with mobile marketing, I interview Rich Brooks. The Social Media Marketing podcast is an on-demand talk radio show from Social Media Examiner. It’s designed to help busy marketers and business owners discover what works with social media marketing. In this episode, I interview Rich Brooks, author of The Lead Machine: The Small Business Guide to Digital Marketing. He’s also host of The Agents of Change podcast and The Agents of Change Digital Marketing Conference. Rich explores how local businesses can use mobile marketing to deliver relevant messaging to their customers. You’ll discover how to combine mobile marketing with social media. Mobile Local Marketing: Reaching the Mobile Customer featuring insights from Rich Brooks on the Social Media Marketing Podcast. Share your feedback, read the show notes, and get the links mentioned in this episode below. You can also subscribe via iTunes, RSS, or Stitcher. In 2017, every business should focus on mobile, Rich says, especially businesses with physical locations and a local audience. Mobile is important because people always have their devices by their side. For example, when Rich takes his daughter to volleyball practices in different towns, he uses Waze on his phone to get directions. Then after dropping her off, he goes to Yelp to find a coffeehouse or asks Google or Siri to find the nearest supermarket so he can go shopping. While he waits in line, Rich explores Facebook, Twitter, or Instagram; plays a game; or reads a news article. Mobile local marketing helps you reach customers who are on the go near your location. Because people are always on their phones, local businesses can attract customers who are looking for information on the go and making immediate decisions. If those people are in your area, you can capture their business with a strong mobile presence. Listen to the show for more about how potential customers use mobile. To engage people on mobile, Rich says you can create mobile offers, which are being redeemed at 10 times the rate of old print coupons. Mobile offers take many forms. You can run a Facebook campaign on mobile, promote an offer that’s available on a mobile device, or tell people they can download a deal onto their phones and show it at the counter. Another option is SMS text messaging. Rich explains that SMS offers work a lot like email marketing. For example, a pizzeria can send people discounts. A massage therapist near Rich gives customers who opt into SMS text messages first dibs on appointment times that open up due to last-minute cancellations. SMS messages can help drive local foot traffic into your store. After you’re set up to send messages, you can start building your SMS marketing list. Rich emphasizes that people will sign up to receive messages only if you offer an incentive for signing up. For a pizza business, that incentive might be a dollar off, a free topping, or free delivery. Rich suggests promoting your SMS list on your social media profiles, website, flyers, and product packaging (such as pizza boxes). Rich says you can expect a smaller but more engaged audience for your SMS messages. Fewer people will opt in, but right now those who do are much more likely to look at their text messages immediately. Rich predicts that engagement with SMS messages may drop off if people become overwhelmed with text messages, but says that currently SMS is still fairly new and can be a boon to a local business. Rich treats his phone number as his last bastion of privacy and stresses that you need to be very respectful of your customers’ boundaries when you send SMS messages. 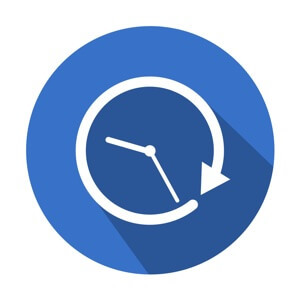 Keep your targets’ schedules in mind when timing your messages. To keep people from unsubscribing from your list, Rich says to be careful about the frequency and length of messages. Limit messages to 160 characters, which is the original size of a text message. Otherwise, certain platforms will split your message into multiple texts. Timing is also critical. If you want people to stop by your grocery store on the way home to grab pre-packaged dinners, you need to understand exactly when customers start making those decisions. Rich and I talk about how a CRM (customer relationship management) database can help you manage SMS marketing. For example, if someone who opted in hasn’t bought anything from you in three or six months, that timeframe can be a trigger that automatically sends that customer a text message or email reminder about your business. Listen to the show to learn how we used SMS to launch the Social Media Marketing Society at Social Media Marketing World. Social media platforms can be a great way to reach a local audience without asking for anyone’s phone number. Rich says the popular social media platforms were either made for mobile (like Twitter, Snapchat, and Instagram) or have been overhauled so that they feel native (like Facebook). Even LinkedIn has a decent mobile experience these days. For organic reach, you can create content directly on these platforms or with any number of cool apps. For example, Ripl is an app for creating interesting images that can help your content get noticed. However, Rich says that you can’t rely solely on organic reach; ads are important as well. Listen to the show to hear on which platforms Rich has had success with ad campaigns. 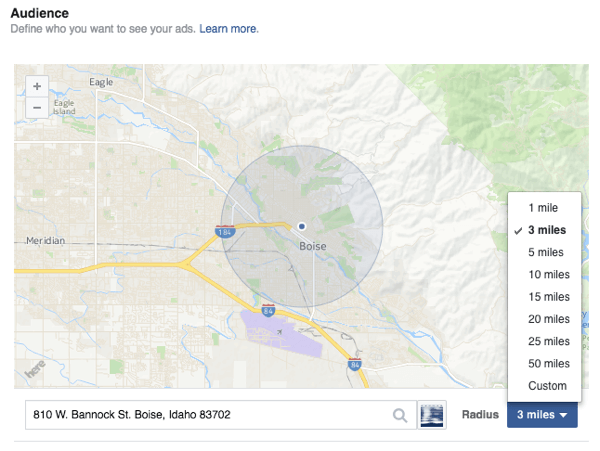 To target mobile ads to people in a certain location, you can use three techniques: geofencing, geotargeting, and beaconing. Geofencing is like a virtual line around a geographic space. As soon as someone enters or leaves your defined area, you can show them ads or offers. To receive these offers, someone must have downloaded an app with these capabilities or be surfing the web. There are three ways to target mobile users with your messages. For example, if you have a puzzle shop at the mall, you could set up a geofence around the mall and parking lot. As soon as people (with their devices enabled) come into that geofenced area, you can show them an ad with a deal. Snapchat is a popular app with geofencing capabilities. For example, you can offer a Snapchat filter in a certain location, such as a conference or in your puzzle shop, to advertise your event or store. However, you need to know that your audience is using Snapchat and then let customers know the filter is available. Rich believes that incentivizing people can increase engagement with a Snapchat filter. For example, at last year’s Agents of Change conference, people who shared a picture taken with the Agents of Change Snapchat filter could enter a contest for a free pass. Rich says that incentives are especially beneficial when you’re asking people to participate in new activities. If geofencing is a blunt instrument with straight lines, geotargeting is a much more nuanced tool with fuzzier lines, Rich explains. Start with a geographic area such as a state, 50 miles within a city, or a zip code. Then, within that area, you target potential customers based on additional information. Rich says geotargeting helped him get the best value for the money he spent promoting Agents of Change. Most people who attend Agents of Change come from New England, so Rich targeted digital marketers, social media managers, and entrepreneurs in that geographic area. For example, his ad on Facebook targeted people in Maine and Northern New England who like Social Media Examiner, HubSpot, and so on. 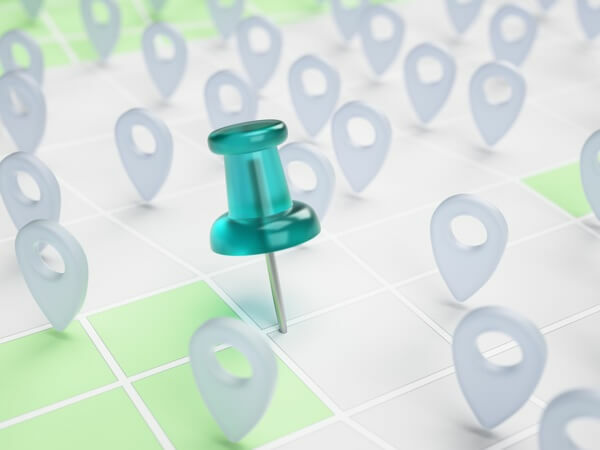 If your business draws customers mostly from the immediate area, Rich says geotargeting can help you target potential customers in that area. For example, if you have a barbershop, you can probably limit your ad to your local area, target only men, and maybe focus on those with beards. Another option is to upload your email list to Facebook and then target people within 25 miles of your city. You can also limit your ad to mobile users. Take a wide area and add specific criteria to geotarget your ideal customer. When I ask if you can target the restaurant next door, Rich says for that you would use geofencing. He has heard examples of a neighborhood coffeehouse geofencing the Starbucks across the street, telling customers they would receive half-price coffee by showing the ad. Beaconing has a very small range, such as in-store displays, because it uses Bluetooth technology. For example, Rich says a big-box store might have a Bluetooth-enabled kiosk that can send messages to customers as they walk by. To receive these messages, a person needs to have a special app or surf a website that taps into the ad network. Or you can tell people they’re in a beaconing area, and if they want more information about something, they can click a button. Listen to the show to discover why location-based technology is both a little scary and exciting for marketers. 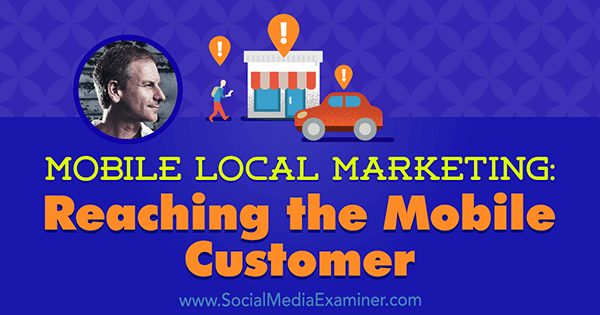 Rich thinks local search is critical for a local business. These days, Google serves customized results based on who you are, your search history, your location, and the intent someone on mobile or a desktop might have. For example, on a mobile device, you’re more likely to see the “snack pack,” which is a map and three location listings followed by the option to see more locations. 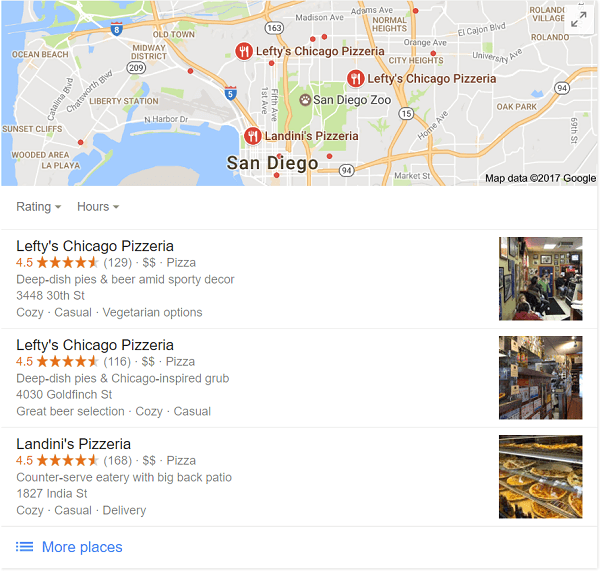 Small businesses with physical locations and a geographically targeted audience need to do everything they can to get into that snack pack, which appears above the organic listings. Even if your business is number one in the organic listings, the snack pack makes your number-one ranking less important. The top three results (a.k.a. the “snack pack”) appear above the organic listings. To get into the snack pack, standardize your name, address, and phone number (sometimes called the NAP) online. For some reason Google struggles when you abbreviate street as “St.” in one place and “St” in another, and spell out “Street” in a third, Rich explains. Make sure your company name, address, and phone number are identical everywhere: on your website, on all of your social media sites, and on all listings in online yellow pages. Companies such as Moz.com (a paid local search service) and Yext have made this process easier. For instance, Moz tells you where you have duplicates and which information is wrong. Then you do a “claim and cleanse.” In this process, you prove you’re the business owner and then clean up your results for consistency. After you own that listing, you can add photos, clean up how your business is categorized, and more. Rich says he almost never opts to see more choices than the snack pack. If your business doesn’t appear in the top three, it’s basically invisible in local search results. The snack pack is a big deal for local businesses. Listen to the show to hear Rich’s thoughts on map integration on mobile. Learn more about Rich on his website. Read The Lead Machine: The Small Business Guide to Digital Marketing. Attend The Agents of Change Conference. Listen to The Agents of Change podcast. Take a look at StreamlineMarketingWorkshops.com and listen to Rich’s new podcast. Follow @TheRichBrooks on Twitter and Instagram. Check out the mobile apps for Waze, Yelp, Google, and Siri. Learn more about mobile coupons. Explore MailChimp, Constant Contact, and AWeber. Learn more about geofencing, geotargeting, and beaconing. Take a look at TripAdvisor. Watch our weekly Social Media Marketing Talk Show on Fridays at 8 AM Pacific on Huzza.io, or tune in on Facebook Live. Learn more about Social Media Marketing World 2017. If you enjoyed this episode of the Social Media Marketing podcast, please head over to iTunes, leave a rating, write a review, and subscribe. And if you listen on Stitcher, please click here to rate and review this show. Click here to subscribe via RSS (non-iTunes feed). You can also subscribe via Stitcher. What do you think? What are your thoughts on mobile local marketing? Please leave your comments below. 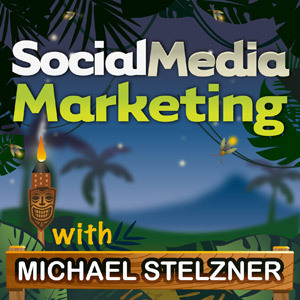 Michael Stelzner is the founder and CEO of Social Media Examiner, and host of the Social Media Marketing podcast. He also authored the books Launch and Writing White Papers.